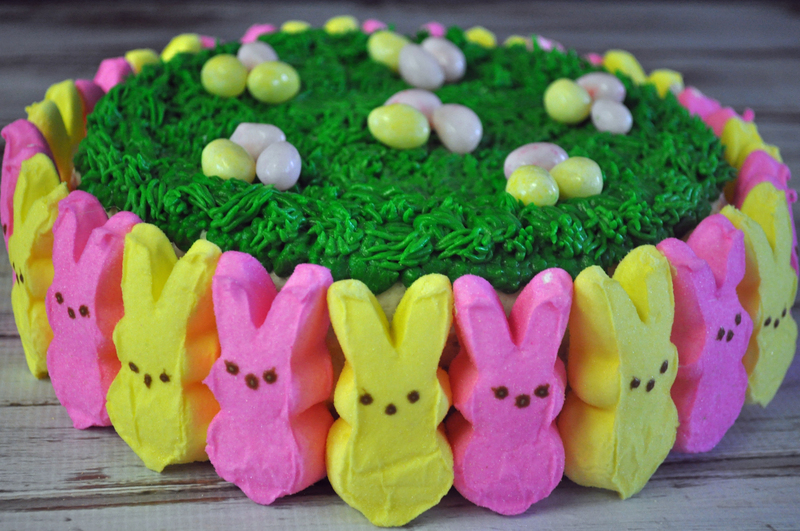 Celebrate Easter with an PEEPS Easter Cake. This simple Easter cake with peeps around will be an egg-cellent addition to your dessert table. I’m always looking for an excuse for baking so with Easter right around the corner and a couple of boxes of bunny PEEPS in the cabinet I decided to make an Easter cake made with PEEPS. I made the mistake of letting the boys see the PEEPS so the next hour seemed to take forever to pass by as the starred at the PEEPS while I made the cake. 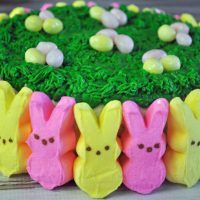 The PEEPS Easter Cake is pretty simple to make and is sure to be winner in the eyes of children, especially surrounded by the colorful sugary marshmallows. You can make it any size with any flavor of cake, box or from scratch, and can use any color Bunny PEEPS, we used the yellow and pink ones, you will need 22 for an 8 inch cake. How to make a PEEPS Easter Cake. This PEEPS Easter Cake is made with a yellow cake base and is decorated with green frosting piped with a Wilton tip #233. If you don’t have a Wilton cake decorating tip, you can just spread the green frosting on the top of the cake using a knife or spatula. Coconut tinted with green food coloring could also be used as the “grass” on top of this PEEPS Easter Cake. Spread the frosting around the sides of the cake which will act like glue and then press the PEEPS onto the side in any pattern of your choice. 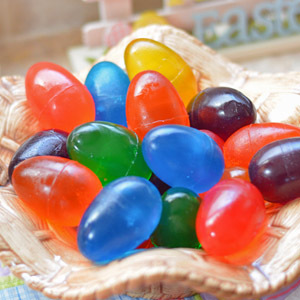 Top the Easter Cake with additional marshmallow PEEPS, jelly beans or M&Ms. 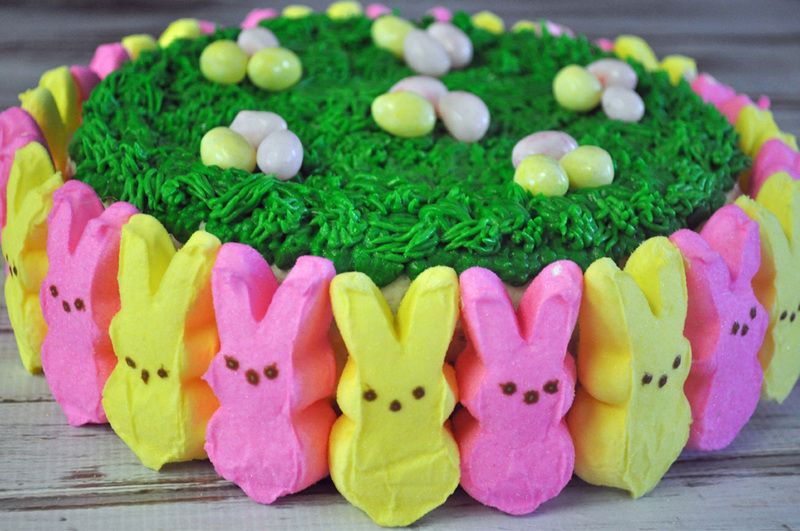 Celebrate Easter with an PEEPS Easter Cake. 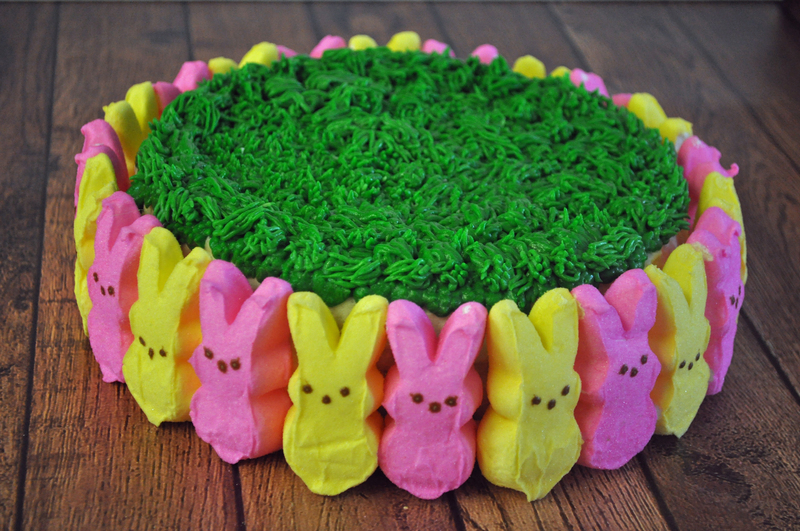 This easy Easter cake with peeps around it is an egg-cellent addition to your dessert table. Frost sides of cake with white frosting, stick PEEPS on the side. If they are not sticking add frosting to back of PEEPS first to create "glue." Using Wilton tip #233 pipe grass on the top of cake. Have you ever made an Easter cake with peeps around it? I spotted some chocolate flavored PEEPS the other day and can’t wait to make cupcakes with them. 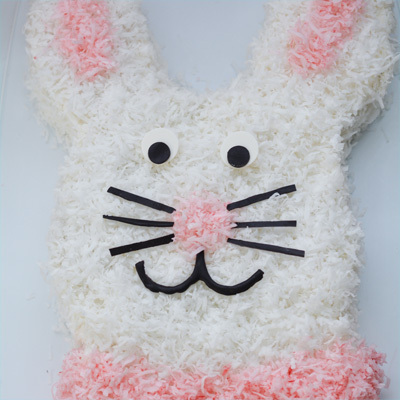 Save this egg-cellent PEEPS Easter Cake idea for the spring. Looking for other Easter desserts to make? 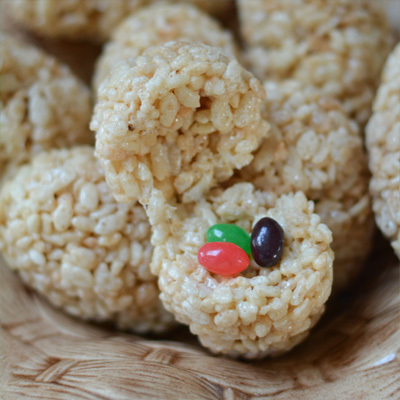 Try the easy Easter Bunny Cake, Easter Dirt Cups, Rice Krispie Easter Eggs or Jello Eggs. Beautiful cake for easter, would even look great sitting in the middle of the table as a centerpiece in a cake stand, until it’s time to eat! 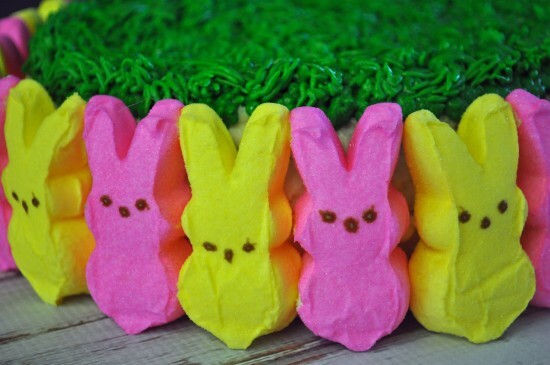 I love my peeps too! I have such a sweet tooth for them! 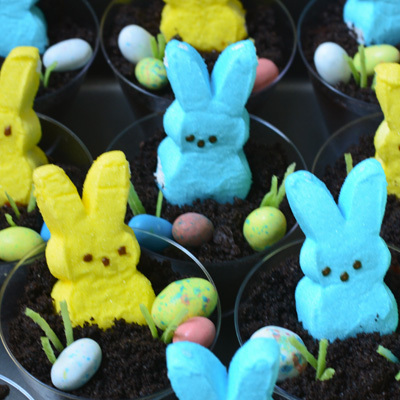 I have seen so many cute recipes with Peeps and this one is so simple and really cute. This is beautiful!! i want to try to make one!! I have troubles making a regular cake look normal! Now that cake is serious sugar overload. Pretty, though. I love this Peeps Easter Cake! It is so pretty and I will have to save the recipe and make it for Easter next year! This is so adorable! I admit to having an unnatural love of Peeps.